Considering Helping Canadian Police For A Reward? Welcome. My name is Jack Steele. In 2001, at great personal risk, I helped the FBI and Canadian police arrest a killer–one of the most wanted men in the world. I helped because it was the right thing to do. But I also did it for the money—a promised $1 million reward. After the murderer’s arrest and conviction, the FBI paid me their share of the reward, just like they said they would. But the Canadian police groups that had promised a $547,000 reward back when they needed my help have now turned their backs on me. They won’t pay me a dime. The lesson? When you’re dealing with Canadian police, a promise made is not a promise kept. I created this website as a resource–and a warning–for other tipsters who may be considering helping Canadian police groups in exchange for a reward. The police will try to dazzle you with promises of rich rewards. But unless you demand written assurances up front, and treat the relationship like a cold-blooded lawyer negotiating a business deal, you could end up risking your life for nothing. So think twice before cooperating in Canada. If you already are a tipster in a criminal case, or are contemplating helping the police in Canada to crack a case, I want to hear from you. CLICK HERE TO EMAIL US your story, and I will treat your information confidentially. Or CLICK HERE TO LEAVE A COMMENT on the open blog, so everyone can read more. I have been collecting other examples of tipsters who have been deceived by the police in Canada, and will turn over my findings to the media and Canadian lawmakers. I want to ensure that anyone who puts their life on the line in a criminal case in Canada, and lives up to the terms of a reward offer, gets the money that he or she deserves. Jack Steele is not my real name. I can no longer use my real identity, or reveal my whereabouts, because I helped infiltrate a dangerous group of anti-abortion radicals who still might try to harm me. In 1999, at the FBI’s urging, I penetrated an extremist anti-abortion organization that was operating in Canada and the U.S., shooting doctors who performed legal abortions in both countries. After almost two years undercover, I was able to learn the secret address in France where the group’s triggerman, James Kopp, was hiding. I gave the address to my FBI handler, and Kopp was arrested days later. Together, the FBI and a group of Canadian police organizations were offering more than $1 million in reward money for information leading to Kopp’s arrest and conviction. 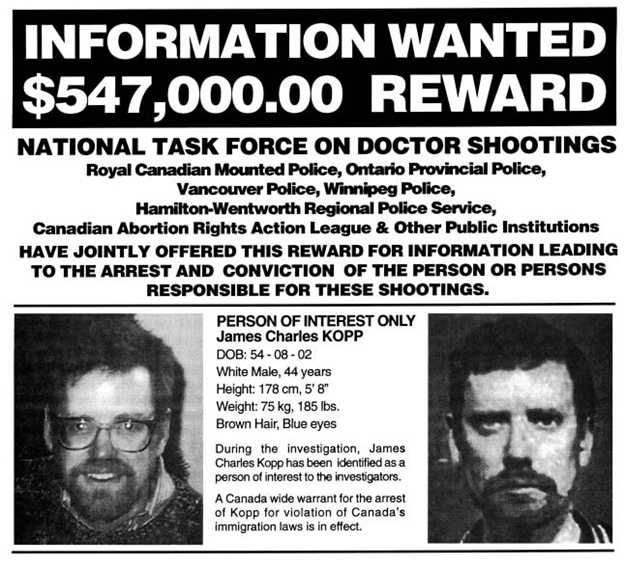 Here’s the Canadian Wanted Poster for Kopp, announcing a $547,000 reward. After Kopp’s conviction, the FBI determined that I deserved the reward money, and the FBI paid me its share. But today, eight years after Kopp’s arrest and nearly three years after his federal conviction, the Canadian police groups refuse to pay up. My story is just one example of what really happens to tipsters in the Canadian justice system, after the arrest is made and the newspaper headlines fade. Don’t make the same mistakes I made. READ MORE.